Korada recipe with step by step picture and video. 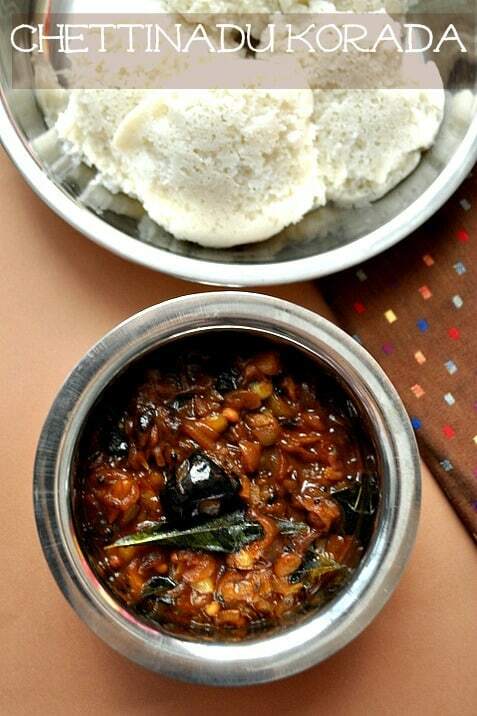 Korada recipe is a chettinad side dish recipe, we can have it with vella Paniyaram and idli. Getting bored of making usual chutney make this unusual chutney Korada, it sweet sour spicy in taste and has a unique flavour. We usually call it as tri-taste chutney(moondru suvai chutney) from Chettinad cuisine. This is one of my fav which the shallots give nice flavour like Vengaya Vadagam Chutney/ karuvadaga chutney. The speciality of this dish are Shallots(chinna vengayam). I know many of us avoid shallots in cooking because it causes an irritating sensation to our eyes while peeling it,but it is also good for our eyes. Shallots enhance the flavour in cooking and also it has a lot of medicinal qualities and health benefits. Please don’t avoid shallots in cooking. Korada is a chutney, made of tamarind, shallots and jaggery. 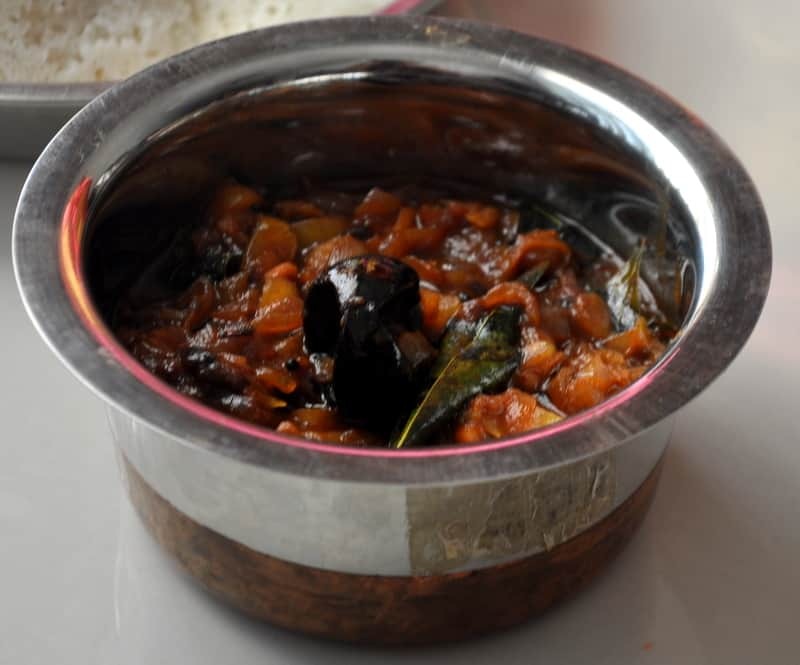 The famous Chettinad cuisine usually calls for shallots and thus the taste is extraordinary. I had this before in a relative house but without knowing its speciality. Recently a friend from karaikuddi made this side dish for paniyaram, after tasting this I planned to post here. It is very simple and easy recipe and also it won’t take much time to prepare. If you have peeled small onions in hand then it is very easy to make. If you are looking for more chutney recipes check Chutney thogaiyal recipe here. Take shallots(chinna vengayagam) in a bowl. Add water and let it soak for 1 hour. After 1-hour start peeling it. If you in the water you won’t feel the irritation and also you can peel the skin very easily. Whenever you get time, you can peel the skin and keep it in an air tight container, store it in the fridge. 2.Crush the ginger and garlic add it to the pan and saute well. 3.Now add in the Chopped shallots and fry well, till it becomes golden brown. 4.Add red chilly powder, turmeric powder and salt mix well. 5.Add the Tamarind Extract, close lid and cook. 6.Once it becomes thick, remove it from the flame. 7.Transfer it to the bowl and serve hot with idli and dosa. Crush the ginger and garlic add it to the pan and saute well. Now add in the Chopped shallots and fry well, till it becomes golden brown. Add red chilly powder,turmeric powder and salt mix well. Add the Tamarind with the lid and cook. Once it becomes thick add jaggery and remove it from the flame. Transfer it to a bowl and serve hot with idli and dosa.